Thinking of giving an Escape Game to a friend or family member? Order a gift-card from our website and you’ll receive an electronic voucher, or (for 3€) a physical gift voucher. 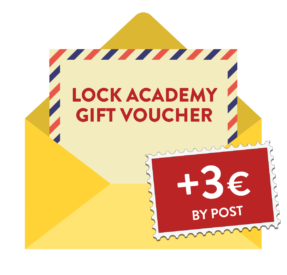 The lucky recipient of the voucher will be able to book their own escape game on your website at the time they choose. The gift voucher is valid for an Escape Gape up to one year from the date of purchase.